Idaho-based Indie-rock band fronted by Dough Martsch, Built to Spill, return to Brighton with their eighth studio album Untethered Moon, finding the middle ground between postmodern, Pavement-style pop and the loose, spacious jamming of Neil Young. 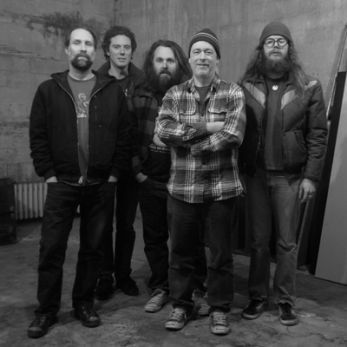 Built To Spill are set to return in 2015 with their eighth studio album, Untethered Moon. Under the command of constant leader, Doug Martsch, as well as a new rhythm section, Built To Spill’s creative process continues to ebb, flow and evolve in its own orbit, reemerging on record for the first time since 2009’s There Is No Enemy with ten new songs that fit at once into the band’s resonant catalog while infusing fresh energy into that signature sound. Martsch formed the first incarnation of Built to Spill in 1993 and debuted on record with Ultimate Alternative Wavers. Afterward, Martsch moved the band over to another Seattle indie, Up Records, and revamped the rhythm section, in keeping with his plan to make Built to Spill a loose aggregation that would allow him to work with a variety of musicians. From there Built to Spill's has continued to grow, and despite many band drop-outs, additions, re-emergences, Martsch has been able to constantly energise the project whilst maintaining a signature sound. With Untethered Moon, the band traveled to Portland, Oregon, to record with producer Sam Coomes, the Quasi founder whose keyboard playing appears on several earlier Built To Spill albums. All in all, it’s the unmistakable sound of Built To Spill, but with a new energy that hearkens back to Martsch’s beginnings all those years ago in Twin Falls, Idaho. Disco Doom is the Zurich based band of Anita Rufer, Gabriele De Mario, Flo Goette and Tobi Schramm. It's mainly two guitars, vocals, bass, drum - sometimes some keyboard. Safe to Swim are a Brighton, U.K. based ‘Heavy Pop’ four-piece combining the sleazy fuzz sounds of grunge and indie rock with the upbeat sensibilities, hooks and melodies of the Pop world.